November? I think you mean Movember. 1 in 6 men will be diagnosed with prostate cancer in their lifetime, and yet for some reason it is never talked about. But, together we really can help change this. I implore all of my readers to please get involved with raising awareness this month, whether it be by growing a fine mustache of your own, asking your boyfriend/husband/father/brother/son to grow one, or simply donning a funny fake. If mustaches don't seem quite up your alley (although the image above may tempt you otherwise), you can still help to raise money and awareness. Please click to get more information from The Prostate Cancer Charity or to get involved with Movember. Amen. Agree with you completely....men, get into this cause. Well worth it! my father already has a mustache (he looks like santa). I think it's a funny alternative way to promote awareness. Hope you had a lovely weekend dear. I totally agree with you. We definitely need to spread awareness of this. All of us guys need to take this more seriously. Is this sort of like no shave november? cool! but perhaps refined..
Well..my friend really loves no shave november. he shaved his head but has plenty on his face. he loves his neck beard. this sounds great. love the post. I'm not sure why Newt shaved his head on Hollyoaks..but of course in my fan fic it was for a different reason. So interesting.... I'm all for this kind of things to awareness important causes like this. thank you for raising awareness of such an important issue.Prostate cancer is really an issue and taking so many lives. this is so amazing!!! i will definitely tell everyone i know to grow one haha. Haha, I love mustaches. This is an excellent excuse to encourage some of my guy friends to cultivate them. I agree! Great informal post! I gave you an award on my blog! Well, I'm not going to grow a mustache (sorry, LOL!) but I will make sure my boyfriend does. I actually work with a few guys who grow facial hair every November for this cause. :) I think it's pretty cool! Fantastic way to raise awareness! It is such a serious health issue and often goes undiscussed. I have a mustache already! Haha, luckily I bought a fake mustache the other day! I keep it in my wallet in case of a mustache-related emergency and this definitely qualifies as one. Great post! I feel like a lot of guys I know are indifferent about health issues and going to the doctor so it's great you are getting the word out. Hope you had a wonderful Halloween! Great way to raise awareness! I just wish I could grow a mustache because I seriously can't. It's like an weird gene of my that I just can't grow one. 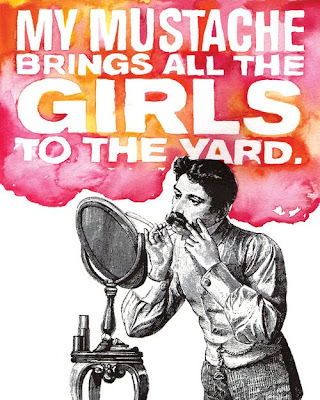 I rarely ever shave for that matter! Mo' on son. Mo' on.